As a new documentary revisits Chile's student uprisings of 2011, one of its producers, Samuel Grove, provides the context and background behind the film. The sight of students taking to the streets of a major city to protest the state of their education system may not strike people as particularly unusual. Or, for that matter, particularly demanding of a documentary. Indeed a superficial perspective of the student uprising that began in Chile in 2011 might reinforce this prejudice. It is not the first time that students have risen up. In 2006, 6th form students protested against centre left President Michelle Bachelet’s rightwing policies on education. A couple of decades before that, in 1989, it was protests on the streets, in which young people played a key role, that hastened the end of the fascist dictatorship of Augusto Pinochet that had ruled Chile from 1973 to 1990. The student uprising that began in 2011 is distinct from 1989 and 2006 both in terms of scope and intensity. The previous two protest movements were relatively narrow in their concern. In 1989, it was for the return of formal elections (significant in itself but no guarantee, as it proved, of a genuine democratic renewal). In 2006, it was for a fairer education system. The uprising in 2011 began as it had in 2006, but quickly expanded to become a more profound challenge to the business model that governs the whole of Chilean society; a model imposed by force by Pinochet, and preserved by subsequent (ostensibly) social democratic governments. The depth of the concerns helps explain the intensity of the protests. Hundreds of thousands of people protested in Santiago and across Chile. The students’ message resonated with vast sectors of society who poured onto the streets in solidarity. The protests could even boast a general strike that lasted for two days in August 2011. The government’s reaction was as predictable as it was repressive. As many images as there are of students and ordinary people demonstrating peacefully, there are an equal number of images of the police using water canons and tear gas. Why call it a student uprising? Because it was the students that initiated and led it. This is arguably where the significance of the protests lies (up to now the tangible achievements of the students have been negligible). What the students represent is a new generation of Chileans, many of whom were born after Pinochet’s regime, who don’t have the fear or pessimism that fascism drilled into the older generations. Our film interviews student leaders of varying ages and political persuasions. All of them, however, believe in a better and brighter future for Chile. Three years on, three of them, Camila Vallejo, Giorgio Jackson and Karol Cariola, have gone on to formal (and we hope) formidable political careers. Our film captures a remarkable moment in Chile’s history when they, along with other students, managed to convince the rest of the population that their dream was possible. 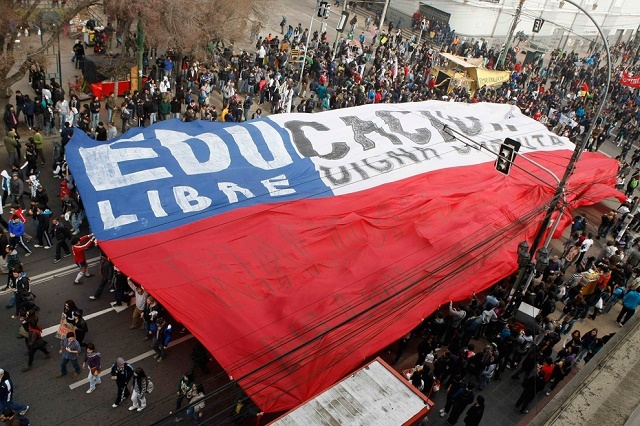 Chile’s Student Uprising(Alborada Films Documentary Trailer) from Alborada Films on Vimeo. Samuel Grove is an independent researcher and writer. He is an editor of www.alborada.net, a website covering Latin America and related issues such as politics, media and also works at Alborada Films. He has a PhD in Critical Theory from the University of Nottingham.